This music takes Liverpool as its inspiration. The city grew rapidly during the 19th Century, it became one of the principal ports for importing cotton, and 8 new docks were opened between 1815 and 1835. A railway was opened in 1825 and this confirmed its importance as a trading centre. People from all around the world came to Liverpool, they came as sailors, passengers, slaves, traders and workers. 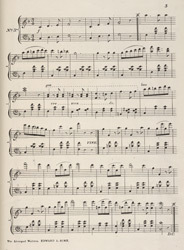 Sheet music like this was bought by the middle classes who entertained themselves at home by playing musical instruments like upright pianos.